Since early 2015, over 70 enterprise IT companies have participated in ActualTech Media events with tens of thousands of viewers logging hundreds of thousands of hours viewing these events as their preferred way to learn about new technologies and the vendors that provide solutions in specific technology spaces. No matter which event flavor you join, we bring to bear our massive IT audience to drive the perfect audience to connect you with the right audience at the right time. Best part: The client doesn’t even need to create a presentation! The client expert shows up and shares knowledge with the ActualTech Media audience. 500 minimum guaranteed leads – we never charge extra when we overshoot our goal! The ActualTech Media audience is clamoring for high quality training content and we’re delivering! MegaCasts bring six or more top presenting vendors together to create dynamic, highly-anticipated events that top data center professionals rely on when making technology evaluations and implementation decisions. ActualTech Media has years of experience helping customers understand various complex technologies. The most consistent audience request we’ve had is for a simple platform to compare vendors, and better understand their different approaches to tech solutions. The MegaCast was designed to fulfill this customer need, and support participants in making an educated choice. 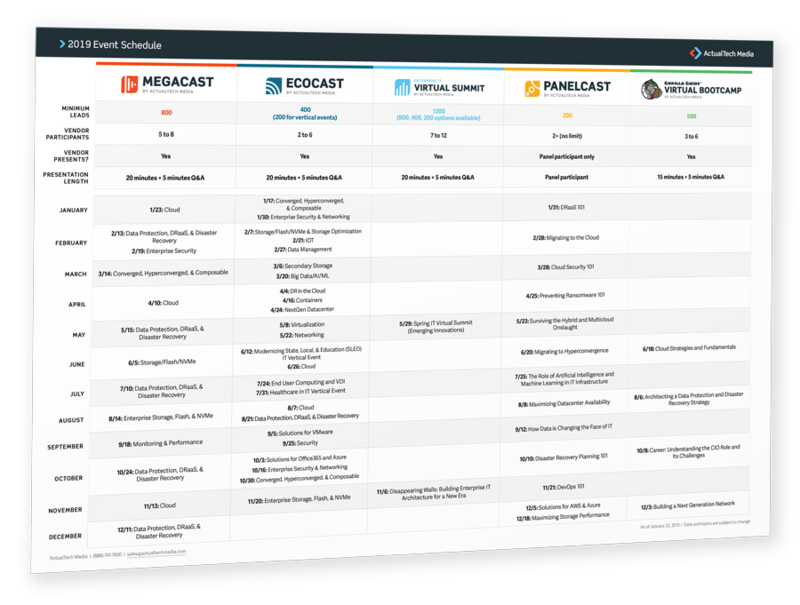 EcoCasts can be thought of as a smaller, three-six vendor version of our MegaCast series. Presentation slots are a little longer allowing for more in-depth demos and discussions, the pricing to present is somewhat lower, and the minimum lead guarantee is 400 vs. the 800 included with a MegaCast. EcoCasts bring together three innovative vendors that are doing interesting things in the EcoCast topic area. ActualTech Media Virtual Summits feature up to 11 leading technology companies from a cross-section of concentrations, including cloud computing, enterprise storage, converged and hyperconverged infrastructure, security, data protection, disaster recovery, and more. With a schedule intended to expose the audience to a broad swath of information, the event will consist of presentations from each vendor presenter as well as keynotes from independent experts, each of whom will share their thoughts, opinions, guidance, and advice with our audience. During this event, each participating vendor will receive up to a 20-minute speaking slot followed by 5 minutes of Q&A from an audience that has proven time and again to be highly engaged. Participating vendors can also assign staff to answer audience questions in real-time throughout the event, in addition to the 5 minutes of live on-air Q&A. But make sure they can type very quickly! During our shorter events, we typically see more than 100 questions come in! At ActualTech Media, we know that regular webinars are a key piece of your quarterly demand generation programs and a fantastic way to educate a fresh audience about your solutions on regular basis. We work with you to develop a webinar programs that tap into our vast audience and help bring your message to a net-new user base. Our turn-key, customized webinar services include co-presenters, content & slide development, platform, promotion, moderation and on-demand and reporting. Talk with us about what you’d like to accomplish with your webinars and let’s develop a unique approach that maximizes your budget!